Look, don’t go and touch – applies particularly to Ormacleit Castle, three miles to the south of Howmore. 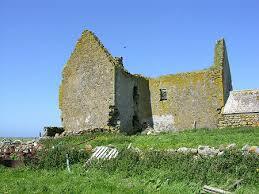 It is on private land and, with the constant weathering on its coastal situation, is in need of protection. Allan MacDonald, Chief of the Clan Ranald, supervised the start of the building in 1701, moved in on completion in 1708 and moved out promptly after a devastating fire in 1715. The problem apparently started in the kitchen where a side of venison was being cooked. Here is one of the latest castles to be built in Scotland and one with a very short period of occupation. It has never been restored.